DeltaDelta’s ‘boarding pillars’ are controversial. Many airlines’ boarding processes are complicated because of the number of customer categories and ticket classes. As airlines create new ticket classes and rewards programs, it can be hard to decipher the distinctions among boarding classes. Looking at an airline’s website reveals how complicated the boarding process has become. Airlines like American,Delta, and United have experimented with new boarding strategies designed to make the process more efficient by focusing on boarding lanes and reorganized boarding groups, but that’s only part of the problem. No amount of reorganization can mask the notion that airlines are creating too many ways to divide their customers. Outside of active US military personnel and passengers who may need special assistance, United uses 19 categories to separate passengers into boarding groups.American has 22, while Delta tops them both with 27. Delta One passengers: Delta’s business class, which is available on some long-haul international flights, gives passengers private booths and seats that become beds when reclined. First-class passengers: Delta’s traditional first-class seating on domestic and some international flights. Diamond Medallion members: Customers can achieve this status by receiving at least 125,000 “medallion qualification miles” (which are based on how many miles you fly and how much you spend on each ticket), taking at least 140 flights, and spending at least $US15,000 on Delta flights. Platinum Medallion members: Customers can achieve this status by receiving at least 75,000 medallion qualification miles, taking at least 100 flights, and spending at least $US9,000 on Delta flights. Gold Medallion members: Customers can achieve this status by receiving at least 50,000 medallion qualification miles, taking at least 60 flights, and spending at least $US6,000 on Delta flights. Flying Blue Platinum members: Flying Blue is a travel-rewards program that allows members to earn points by flying on partner airlines like Delta, Alaska Airlines, and Air France. These members need to earn at least 70,000 “level miles” (which are determined by how many miles you fly, how much you spend on each ticket, and your membership level) or taking at least 60 qualifying flights. Virgin Atlantic Flying Club Gold members:Virgin Atlantic Flying Club is a rewards program for Virgin Atlantic Airlines. Gold members need to earn at least 1,000 “tier points” (which are determined by how many miles you fly, how much you spend on each ticket, and your membership level) every 12 or 13 months. Virgin Australia Velocity Platinum members:Velocity is Virgin Australia Airlines’ rewards program. Platinum members need to earn at least 1,000 points (which are based on how much money you spend and your membership level on domestic flights, as well as how many miles you fly on international flights) and take eight qualifying flights, then earn at least 800 points and take eight qualifying flights every 12 months. GOL Smiles Diamond members: Smiles is the rewards program for the Brazilian airline GOL Airlines. Diamond members have to earn and maintain 35,000 “club miles,” which are based on the number of miles you fly, every 12 months. SkyTeam Elite Plus members: SkyTeam is a travel-rewards program that partners with several airlines, including Delta, and whose membership levels are tied to each airline’s rewards program. Delta Diamond, Platinum, or Gold Medallion members qualify for SkyTeam Elite Plus status. Silver Medallion members: Customers can achieve this status by receiving at least 25,000 medallion qualification miles, taking at least 30 flights, and spending at least $US3,000 on Delta flights. Priority Boarding Trip Extra passengers:Customers who pay an extra $US15 on top of their ticket can board in Zone 1. Reserve Delta SkyMiles credit-card members:The Delta Reserve credit card has an annual fee of $US450 and the most generous benefits of any Delta credit card. Platinum Delta SkyMiles credit-card members:The Delta Platinum credit card has an annual fee of $US195. Gold Delta SkyMiles credit-card members: The Delta Gold credit card has an annual fee of $US95. Virgin Australia Velocity Silver members:Silver members need to earn at least 250 points and take two qualifying flights, then earn at least 200 points and take two qualifying flights every 12 months. Crossover Rewards SPG Platinum members: SPG, or Starwood Preferred Guest, is Starwood Hotels’ rewards program. To achieve platinum status, Starwood customers need to accumulate 25 eligible stays at one of the brand’s hotels or stay for 50 eligible nights each year. 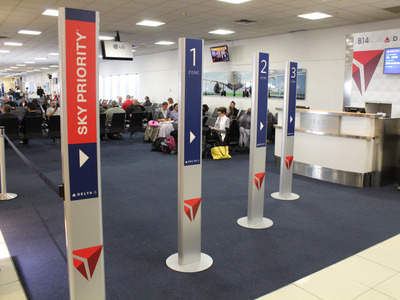 Basic-economy passengers: Basic-economy fares are Delta’s least expensive tickets. They’re available on domestic and international flights and are almost identical to main-cabin tickets, but they don’t allow customers to select a seat before checking in for their flight. A prior version of this story incorrectly said Delta has seven boarding groups, outside of those used for active US military personnel and passengers who need assistance. Delta has seven total boarding groups, but only six for passengers that are not in the US military and don’t need assistance boarding.